The Jackie Moore Salon opened its doors in Winter 2005. The salon welcomes all of those seeking a professional cut and style in a comfortable atmosphere. Jackie Moore specializes in highlights, razor cuts, precision cutting, perms, color, waxing, styling, and waves. 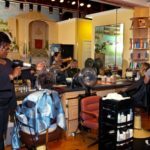 Our small team of talented and experienced hair professionals use the latest techniques and products to give you a signature style that not only looks great, it fits your lifestyle.